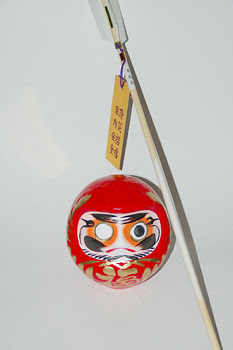 A talisman bought at the New Year in a shrine or temple with the wish for good luck. Also used in rituals of exorcism. 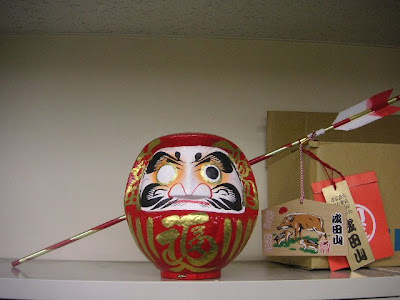 Here we have our Daruma with such an arrow. This one is from Narita. 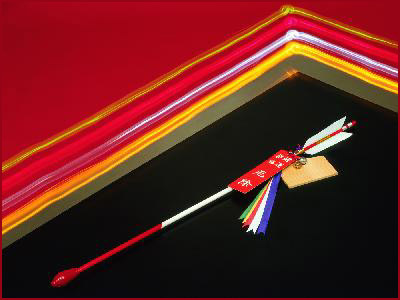 Literally, "demon-breaking arrow," a decorative arrow sold at shrines at New Year's to ward off misfortune and to attract good luck. Hamaya are popular among New Year's visitors to shrines as one type of good-luck charm or engimono. From the Edo to the early Meiji period, hamaya were given as gifts to celebrate the first New Year of a male baby's life, frequently in a set together with a pair of decorative bows called hamayumi ("demon-breaking bows"). The custom of selling the arrow alone is thought to be a later abbreviation of this custom. Even today, the custom persists of standing such symbolic bows and arrows at the northeast and southwest corners of a new house (called kimon 鬼門, the directions thought particularly susceptible to evil influences) on the occasion of the roof-raising ceremonies (jōtōsai). The etymological significance of hama is not clear, but it is said to have been an ancient word for an archery target or an archery contest. The practice of making round targets of braided bamboo or straw, or circles of wood, and throwing them into the air or rolling them on the ground as archery targets was a common children's pastime, but it was also known as a form of New Year's divination used to foretell the fortunes of the coming year (toshiura). When these elements are considered in the context of the current use of hamaya as New Year's good-luck charms, one must consider that the current interpretation of hamaya and hamayumi as "demon-quelling" arrows and bows was rejected by the Edo-period scholar Ise Sadafumi, who asserted that the characters used to express hama were originally adopted merely for their sound, and that the word's true meaning lay elsewhere. ©　Suzuki Kentarō / Kokugakuin University. There is a custom in Japan in which people purchase or receive a hamaya (evil-repelling arrow) on a visit to a shrine for the first time (hatsumode) in the new year (oshogatsu). The arrow is a good luck charm for good fortune in the coming year. Sometimes the arrow comes in a set with a hamayayumi (evil-repelling bow). The origins of the hamaya come from a ritual called 'jarai' (じゃらい), a customary ceremony that took place at new year in the imperial courts to exhibit people's abilities with bow and arrow. 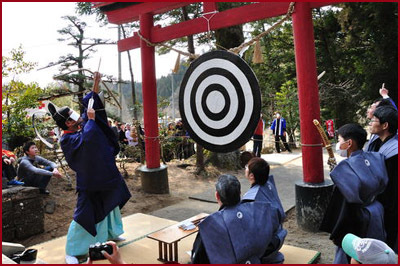 The target used during this ritual was called 'hama', hence the names 'hamaya' ('the arrow that hits the target') and 'hamayumi' ('bow used for the target'). Originally, jarai only took place in imperial courts, but during the mid-Heian period, the word 'hama' ('ha' means 'destroy' and 'ma' means 'evil') changed its meaning. The ritual then became a custom at new year in which common people gave a toy bow and arrow to any family with a male child. Other customs that developed include setting up a hamaya on a ridge in the direction of the 'demon gate' when building a new house, and sending hamaya and hamayumi to relatives and friends on the 'hatsu sekku' (first annual festival) of a newborn baby. A sacred archery ritual which takes place mostly at New Year. 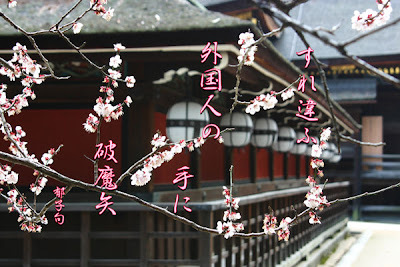 It can be written with the characters 歩射 or 奉射 and has pronunciation variants such as bisha, hōsha and is practiced widely in shrines in all regions. Unlike mounted archery, the bowman is on foot and is called a kachiyumi. In the Heian period court, it was a public ritual held at the beginning of the year. The jarai ritual was held in the seventeenth day of the first month, and this was followed on the morning of the eighteenth day by the noriyumi archery competition. Furthermore, in the Ryō-no-gige, busha is referred as a military art. The court jarai declined and ultimately died out from the Kamakura period, but it was continued at the Taisha in many regions. For example, in the document Suwa Daimyōjin ekotoba, there is a record of a jarai being carried out at Suwa Taisha on the seventeenth day of the first month, and at other times. Busha carried out at shrines are sacred rituals performed as a toshiura, intended to divine good and bad fortune for the whole year, and also as a kitō, or prayer to ward off bad spirits. The practice has long been known at Atsuta Jingū and Kamo Wake Ikazuchi Jinja. At Kyoto's Ōharano Jinja, a busha is performed as a miyaza ritual in the Oyumi matsuri (bow festival). The family that performs this ritual is called the oyumi kabu. In the bisha festival at Kuzugaya Goryō Jinja in Shinjuku (Tokyo), prior to the obisha itself, there are various solemn rituals carried out in front of the haiden, such as offering sake. The use of a large target seems to have been customary since ancient times. The target has concentric circles, or in some places the character oni (devil) is written upon it. 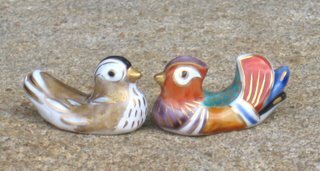 The targets used at the Kuzugaya Goryō Jinja, and the Nakai Goryō Jinja bisha festivals, are characterized by having two birds with outstretched wings facing each other painted on the target. The term bisha can be written as 備射, 備謝 or 飛謝. 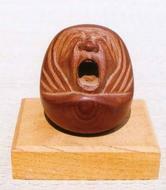 Yumi kitō, mato-i, momote are alternative names for busha. See also bushasai (written as 奉射祭 or 歩射祭). first shooting at the Inari shrine . Here are some shrine maidens preparing these arrows before the new year. This HAMAYA (Decorative Arrow) and HAMAYUMI (Decorative Arrow & Bow) have been blessed for warding off evil. 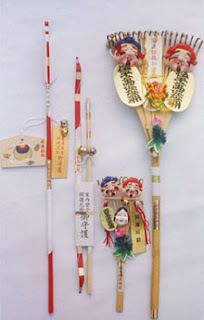 The other two lucky charms for the New Year are called Kumade (Bamboo Rake).
. Jarai 射礼 (じゃらい) shooting ceremony . Danke für deine interessanten Informationen, liebe Gabi.
. Yamashiro Ichi no Miya 山城一の宮 - Kamo Mionya Jinja 賀茂御祖神社 .